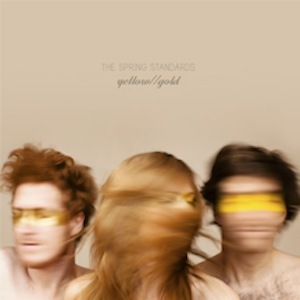 The Spring Standards are a talented trio of musicians hailing from Brooklyn, NY. They have toured the US relentlessly over the past couple of years and are finally releasing a new album in the form of the Yellow//Gold EPs. These New Yorkers play a form of indie folk rock that is both catchy and intriguing in their songwriting. Sometimes the songs sound nothing alike. All three members are multi-instrumentalists and share vocal duties. Not one song on either of these EPs is bad, it just fails in finding a true identity for the band. Each singer holds their own on their respective songs, it just doesn’t flow well when the next song is completely different than the previous. Heather Robb stands out on EP openers “Only Skin”(Yellow) and “Nightmares” (Gold‘s closing track). “Unmarked Pill” is an epic electro-pop-rock song simliar to a musical rollercoaster ride that peaks and drops, then ends with a jazzy like horn leading a steady drum beat. The Spring Standards sound great when all three members are featured vocally in a song and the sound tends to blend well with the rest of the music. Not a bad album at all, it just takes a little time to get used to.